MEANING OF NAME: Name was given to her by her previous owner. Soo was purchased from Sook Keningau market, hence was named Soo. HISTORY: Soo is an orphaned sun bear. She was sold then purchased in Karamatoi village in Sook Keningau market with the price of RM350 when she was still a cub. She was kept as a pet for two years in Nambayan village in Tambunan, that is located in the interior division of Sabah. When she was kept as a pet, she was housed in an iron cage and fed with rice, milk, fruits, cabbage and cucumber. On the 8th of September 2017, she was rescued by Sabah Wildlife Department and transferred to BSBCC. 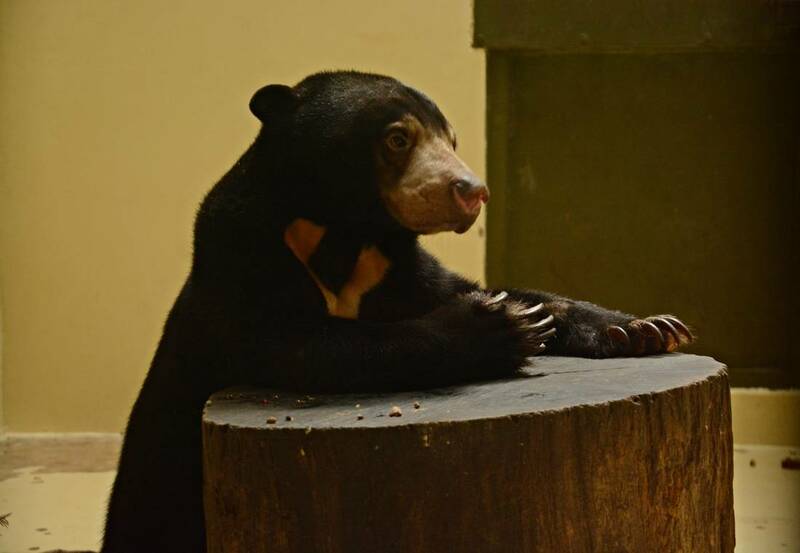 Soo is a healthy sun bear and weighs at 25.7kg. PERSONALITY: Soo shows a sorrowful face. Her face seems to show a hidden story that she cannot tell. She always stays up high in the cage and is very alert with her surroundings. She appreciates every food item that is offered to her and can eat extremely fast. A favourite enrichment for Soo is the Aussie Dog Ball. The Aussie dog ball is filled with her favourite food, dog biscuits and honey. She plays with the Aussie dog ball in her bear way by throwing and pawing it. She will give warning signs when she feels unsafe. She is still taking her time to adapt in quarantine at the moment. We hope she can gain her trust and confidence in the process of rehabilitation at BSBCC and become a wild bear again.